With this project I tried to recreate a 1930s-style teardrop camper trailer. Well, I am new on this, although I have built a couple of airplanes, worked on flight testing as a structures tech, and specialized on composites. I decided to use the “original composite,” plywood (which happens to be the cheapest, too), to build a compact teardrop camper trailer. It all started on a trip to lake McConaughy in Nebraska. We were lured by a friend who had a sailboat with the promise of a nice lake with sandy beaches, crystal clear water, and a nice camping site. Everything was true but the wind, the frogs, the huge biting flies, and a massive category-five thunderstorm that soaked us inside the tent. My wife said that she had had it with the tent and unless I found something else to camp in, she was out. First, with my helpful neighbour (he is a veteran of Craigslist) I found a dilapidated popup camper. The thing towed nice, but (caveat emptor) when I removed the siding to inspect it, it just fell apart like a deck of cards. That made it easy; tear the whole thing apart and sell the metal to fund some of the new materials. Electric drill and bits 1" ¼" 7 32" 3 16"
The old popup camper was dismantled and some parts were recycled. I got some money from the old aluminum siding and stainless steel lifting mechanism. The frame was power-sanded, first with a rotary wire brush and then with 80-grit sandpaper. Then it was painted with Rust-Oleum rust preventative, and finally covered with Rust-Oleum black paint. Then I made a frame with 2x4 pine studs, with 1/8-inch Luan plywood at the bottom and 1/2-inch plywood on top. I painted it with elastomeric paint so moisture cannot damage the wood, and inserted 1.5-inch insulation foam inside the frame. After that, I glued and screwed on a 1/2-inch birch plywood floor, then painted it with polyurethane paint and covered it with some vinyl flooring. Before I installed the floor, I ran all the electrical wiring for the trailer lights and battery charging so I didn't have to crawl underneath to do it. I made the walls following the outline of the cardboard template. Note that these are fit flush, so that later I can skin them with 1/8-inch Luan plywood and insulate the walls. All the wood used was recycled from construction sites. If you ask, they are more than happy to let you rescue wood from the refuse bins because they have to pay by weight to haul it away. After the walls were built, I attached them to the base frame with eight 1/2-inch hardened steel lag bolts per side. Make sure the walls are aligned to the frame and vertical, so you don't have problems during skinning. I installed interior skins and painted them with elastomeric roofing paint, to prevent dry rot. It will last for a long time. I used Titebond 3 exterior wood glue and brass brads to secure the plywood to the frame. Once the glue is dry, the structure is amazingly solid. Note the 2x2 pine studs used along the curve. They are crucial to making the plywood skins hold their shape. Next I installed the aft bulkhead, insulated with 1.5-inch styrofoam. The diagonal members maintain the rigidity of the box, so it doesn't flex and deform the camper shell. Then the bulkhead was covered with 1/4-inch Luan plywood glued and nailed with brass brads. The bulkhead was attached with galvanized 2.5-inch deck screws through pocket holes (a Kreg jig works well here). Install your electrical wiring before installing the insulation, so you don't have to damage the insulation later. Insulation is installed before the skinning. The sides were routed with a flush router bit (the ones with the little bearing on the tip) to cut fast and nicely the shape of the plywood skins. That way I didn't have to use a belt sander for several hours to do the same thing. After I ran the wiring for outlets and lights on the upper skin, I proceeded to install the exterior skins and painted them with a liberal amount of exterior-rated polyurethane varnish to seal the wood. The sealing is very important to prevent moisture from entering the plywood and delaminating the structure. Make sure you start with 50/50 diluted polyurethane and mineral spirits, to soak the plywood very well, then paint it liberally until you cannot feel the wood grain. Sand between coats with 120- to 180-grit sandpaper. Some people prefer clear penetrating epoxy resin, but I went the cheap way. Then proceeded to build a "hatch" for the kitchen. I would recommend using oak as there may be a possibility of having the plywood skin "pulling" the frame and deforming it. Just take your time. The ribs were made from 3/4" birch plywood, with horizontal pine board reinforcements, and the hatch was covered with 1/4-inch Luan plywood. The windows were made with discarded 3/8-inch plexiglass set on routed frames made of 3/4-inch thick plywood. I set them with silicone and fastened them to the frame with plastic shims (so the windows don't rattle themselves loose on the road). Once the clamshell was made, I needed to attach it to the roof using piano hinges. The piano hinges are on the top side so that the hatch opens like a trunk. After the hatch was attached (I used a couple of gas springs to help open it and keep it open when in use) I set up the kitchen layout with everything I needed to make it comfortable on long trips. The two wires on the right side of the hatch wall are the wiring for the fan, lights and switches. I had to run two 3-wire circuits because the lights and the fan are two separate circuits controlled by two different circuit breakers. Inside I set up a "bunk bed" over the wheel wells. It has plenty of storage space for a catalytic heater, voltage inverter, and blankets and clothing. The roof vent is very important. Make sure it's about 14.25 inches per side, so the vents can fit. The kitchen has a couple of drawers and one retractable drawer for the cooler. The stove-with-oven came handy; it was rescued from a derelict camper. It is gas-operated. The blue container at the left is a six-gallon water container, needed for washing and drinking/cooking water. The interior was first painted thoroughly with exterior-rated polyurethane varnish, then sanded with 180-grit sandpaper, finished with acrylic paint, and decorated by my wife. She was the one who made the curtains and chose the futon covers for the foam mattresses. They keep weight low, and homemade fixtures make it a little more personal. The light switch plate has three switches; two for the lights and the third (red) for the vent fan. The lights are LEDs, which use less electricity, and they last (theoretically) for 100,000 hours. I have found that a powered vent is crucial if you want to sleep comfy. It creates a breeze that will take away some "camping smells." The power panel was made with aluminum, and contains a power inverter, a 110-volt outlet and a couple of 12-volt outlets. Very useful if you want to use electrical appliances, as long as they don't draw excessive power. If you decide to build a trailer like this on an old trailer frame, make sure to clean and inspect the trailer's wheel bearings. If they look worn, discolored or pitted, replace them. Always check your vehicle's towing limits and install electric trailer brakes if needed. Inspect your wheels and make sure they are roadworthy. There is nothing worse than having a wheel incident on the highway or away from civilization. Always check tire pressures before any trip and make sure your tow hitch and ball are in sound mechanical condition. Always check your trailer lights before attempting to travel. Having no lights at night can lead to serious accidents. As a rule, for safety and stability, the tongue weight should be between 10% and 15% of the total trailer weight. More than that and you can have "fish-tailing" and lose control of your trailer; less than 10% and the trailer could detach from your vehicle, or you could have problems with directional stability. The power inverter / battery control box was homemade. I used a 4-amp 120VAC to 9VAC step-down transformer, with a diode rectifier bridge and a capacitor to absorb the peaks. This gave me a clean 12VDC power supply. It has a toggle switch (220-volt rated) to switch between external power and battery power. The center position is "off." The hatch lights are very cheap closet LED lights. They use 2 AA batteries and are the push-on/push-off type so I don't have to fumble trying to find the switch in the dark. It has a pop-up breaker for every circuit; 3-amp for the lights, 7-amp for the power inverter and a 10-amp for the external power. Loads are light and I ran everything with 12AWG nylon-shielded multiple-strand copper wire, so there is no risk of getting a short circuit. The stove works very well, but in high-wind situations it may need a wind shield. I used storm-screen latches to keep the drawers and cabinet doors from opening on the road and spilling stuff all over the kitchen (especially on rough roads). The main latch is made with a modified garage door latch. I inverted the mechanism to make it "normally closed." I used vinyl banner material to make the hinge area waterproof and keep water from entering the kitchen area. I made the entrance with a double door because I planned on it becoming a "multipurpose trailer." When the two doors are open, I can put my tool box inside the camper for transport. The shelf works very well for holding a small laptop, DVD player or a small heater. It has a snap to keep it closed when not in use, and a couple of small multipurpose canvas bags to keep small items like flashlights, toiletries, bug repellant, keys, etc. The secondary door has a couple of edge door latches that keep it "normally closed." The window has a couple of old-style window latches. They are low-profile so they don't protrude and poke people. 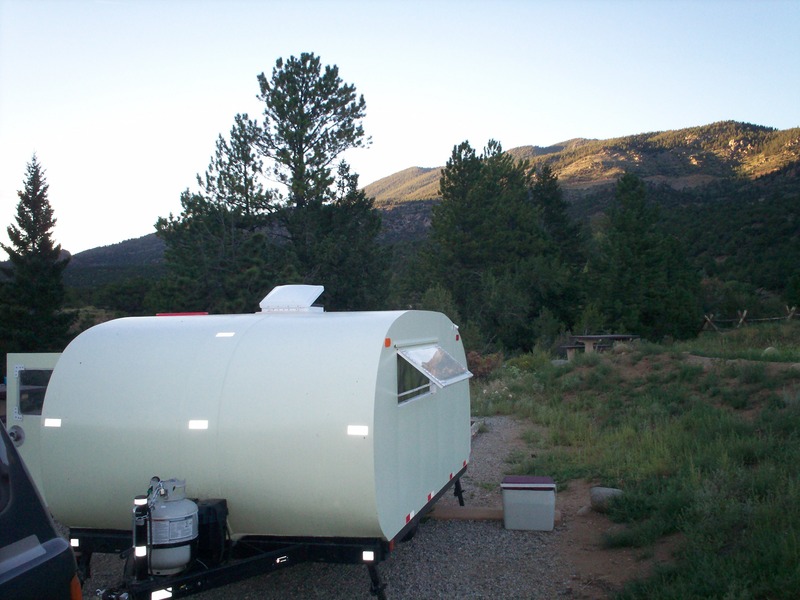 The trailer tongue holds the battery box and the propane bottle. The gas line and battery wires run parallel under the trailer, separated by at least 8 inches for safety. At last, a good camping site, and peace all around. Just beware of the chipmunks...they are bold. I have tested the trailer at very low temperatures (-10 Fahrenheit) and with a small catalytic heater it was very comfortable. Not that you would like to camp in that kind of weather, but the insulation made it a great "emergency shelter." This project can take some time depending on your skills, work space, weather, and time availability. Make sure you find a design that fits your needs, and make sure you follow safety rules around power tools. Fingers don't grow back.